Monday, January 9th from 2:45 pm to 6 pm through Wednesday, January 11th from 2:45 pm to 6 pm. Thursday, January 12th from 2:45 pm to 7 pm. Based on the Pulitzer Prize winning novel Tales Of The South Pacificby James Michener. 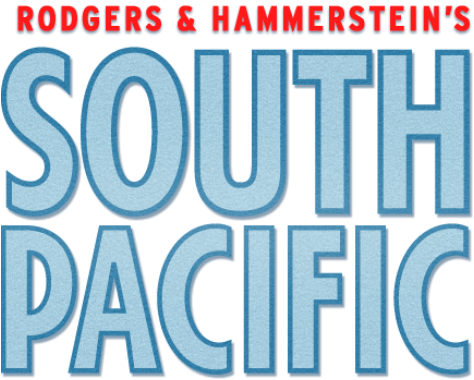 South Pacific is a musical with a more serious message than most others created in its time period. It is one of only a handful of musicals to win the Pulitzer Prize for drama. Nellie Forbush is a nurse working overseas during World War II. She falls in love with a wealthy, older man who owns a plantation there. When she discovers that the mother of his two small children was a Tonkinese woman, the prejudices she grew up with in Arkansas prevent her from accepting his offer of marriage. Her friend, Lt. Cable, has a fiance back home, but speaks of her with a sense of duty rather than feelings of love. When he meaets a young, innocent Tonkinesse girl, he too is forced to face his prejudices. Prepare one of the attached short duo scenes with your choice of acting partner for your Acting audition Wednesday, January 11th. Choose a scene that showcases your best acting talents. It doesn't matter which scene/character you choose, we will consider you for any/all characters in the play. It is fine to do your scene with a friend. You do not have to memorize your script. Just make sure you are very familiar with the content so you can get your head out of the script and show us some characterization, diction and projection. Everyone will be taught a simple dance routine from the dance choreographer for your Dance audition Monday, January 9th. Once you learn the steps, you will perform in a small group. Everyone must wear comfortable clothes and shoes that you can dance/move in. . . no sandals or flip flops. For those of you who think they can't dance, there are plenty of roles in this show that do not require dancing.